In Sound Speed Marker the three video installations and related photographs, covering a span of five years of work, explore film’s relationship to place and the traces that movie making leaves behind. The exhibition includes the premiere of Giant (2014), a work commissioned by Ballroom Marfa. 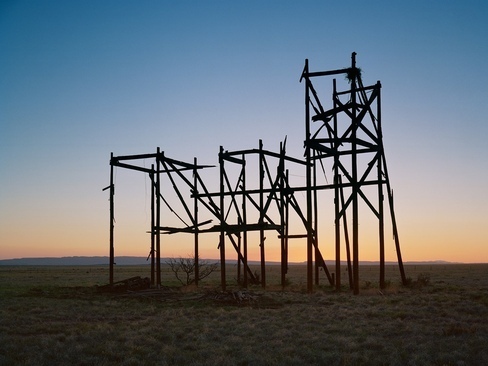 The exhibition will be on view at Ballroom Marfa until July 31, 2014 and will be accompanied by a comprehensive catalogue to be published in December 2014. Sound Speed Marker will travel to the Irish Museum of Modern Art in December 2014 and the Blaffer Art Museum at the University of Houston in May 2015. This entry was posted in and tagged Alexander Birchler, art, Artists, Ballroom Marfa, cinema, film, giant, Hubbard, installation, K. Yoland, Sound Speed Marker, the giant. Bookmark the permalink.